We have so many amazing farmers’ markets in the Portland area, each with its own personality created by its unique vendors, location, and style. I’m making it a goal to get to as many as I can this year – how about you? All titles are linked to that market’s website. This is as comprehensive a listing as I have been able to compile. Please let me know of any additions or changes that you may be aware of. This is the single largest all-agricultural market in Oregon. Farmers, ranchers, and artisan food producers offer a vast array of conventional and organic products. Friends, families, and neighbors stroll or ride their bikes to this Thursday evening market to purchase farm-fresh produce, enjoy dinner from hot-food vendors, and listen to an outstanding lineup of musicians. A fun family atmosphere with music, food, and activities for kids and adults of all ages. You’ll love the fantastic selection of locally grown produce, cut flowers, plants and a great selection of arts and crafts. Look for your favorite produce, baked goods, local honey, fresh flowers, fish, and craft vendors and artisans. This Green Market is proud to be the smallest grass roots open air market in the state. Where: 13100 SE Sunnyside Rd, Clackamas, Oregon; at the corner of 132nd Ave.
Local, affordable, healthy food. Local, sustainable, economic growth. Inclusive community gathering. This volunteer-run Farmers’ Market is owned and operated by Lewis & Clark Montessori Charter School, and hosts vendors, farmers, artists, crafters, live music, food & education. The Estacada Farmers Market is a place for the community to come and hang out, enjoy local produce, handcrafts, art, jewelry, goat milk and handcrafted soaps, bath and body products, and much more. The Fairview Open Air Market is a Green Market: 98% of the produce growers are organic and 2% are considered transitional and follow safe growing practices. This family-focused market strives to foster cross-cultural exchange and provide an outlet for small farmers and food producers to connect with the community. Goods include fresh produce, eggs, meat, honey, baked goods and prepared foods to flowers, plant starts, hand-crafted soaps and more. A community gathering place where you’ll find vegetable and produce farmers, bakers, artists and the like, providing some of the best local fresh produce, meats, cheeses, breads, honey, desserts, flowers, art and hand made crafts. This local market offers farm fresh produce, fruits and berries, crafts, fine art, artisan foods, and live music. One of the longest running farmers markets in the Northwest, the Hillsboro Downtown Market is a favorite venue for obtaining fresh, local products. Relax on the courthouse lawn at this weekly outdoor summer festival and farmers’ market. Features locally grown produce, flowers and plants, art, ready-to-eat offerings, and live music. Where: SW Sunset Road & Capital Hwy, Portland, Oregon, in the Wilson High School parking lot. This year-round market has a great family vibe! Beautiful produce, live music and children’s entertainment, with seasonal events throughout the summer. Local growers and artisans offer fresh produce, prepared foods, and a lovely array of fresh flowers at this neighborhood market. This market is the result of a partnership between Hillsboro Farmers’ Market, Inc. and Kaiser Permanente. This market is open to the public, visitors, students, and employees. The participation of neighboring businesses, the unique location, the street closure, and live musical entertainment all help to create a festive, street-fair atmosphere in the midst of this growing business district. The 20 vendor stalls, proximity to a MAX station and plenty of nearby parking make this market a lively and convenient destination for fresh, local food. This market has become a family-centric destination for the neighborhood to enjoy breakfast or lunch, listen to local musicians, and explore 35 vendor stalls filled with local bounty from our region’s farmers, ranchers, fishermen, foragers and food artisans. Where: 4906 NE 6th Avenue, Portland, Oregon; at NE 7th and Wygant between NE Alberta and NE Prescott Streets, in the parking lot adjacent to King Elementary School. This European-style market offers a wide variety of produce, meats, nuts, cheeses, artisan breads, jams and jellies, baked goods, fresh seafood, nursery items, and hot foods. Portland’s only internationally focused market, LIFM provides fresh, affordable, and culturally unique produce, including unique varieties from local Hmong, Latino, & Russian farmers. Enjoy breakfast or lunch while strolling the market for a wide variety of fresh, local produce and flowers. This market offers farm fresh, locally produced fruits, vegetables, meats, fish, dairy, herbs, flowers, food and craft items. With live music and wine tasting each week, the atmosphere is perfect for community members to gather and shop. Over 75 different vendors provide local produce, meats, cheeses, bakery items, plants, prepared foods, garden crafts and so much more. A vibrant marketplace with a diverse community, providing high quality, local, healthy food. Locally grown fresh produce, flowers, cheese, meat, fish, honey, baked goods, specialty items and freshly prepared food. Stop by for an afternoon of food, music, arts and community! Every third Thursday, seniors are invited to play fruit-and-veggie bingo, where the prizes come in the form of produce from market vendors. Bingo rounds run every half hour, starting at 2:30pm. Each summer the Northwest Market brings the best of the region to the neighborhood through an average of 25 vendor stalls. Offers a wide variety of foods including sustainably grown produce, meat, eggs, nuts, baked goods, dips, lunch and desserts. The market is open to the public, employees, visitors, students and patients, and set in a beautiful courtyard, perfect for joining friends and colleagues for a stroll or to enjoy a bite to eat. Locally grown fresh produce and educational offerings in nutrition, food preservation, sustainable food-growing and protection of the environment. This open-air market features fresh, local, agricultural food and garden products, fine arts & crafts, live music and educational information. Look for fresh produce, meats, cheeses, breads, honey, desserts, flowers & artisan crafts. A vibrant, creative community featuring local musicians, chefs, gardeners, and crafters. Come downtown to the Square to enjoy the abundant lunch options and pick up locally grown and produced items from an average of 30 vendors selling everything from berries to flowers to baked goods. This community run market connects local farm vendors, producers of wholesome food and select artisans to the Salmon Creek community and its neighbors. The Salmon Creek Farmers’ Markets are rain-or-shine markets. Exceptions are: lightening strikes in the area, flooding of market site floor, excessive winds that can cause canopies to take flight. This twice-monthly market offers locally grown produce, flowers, berries, artisan crafts and much more. 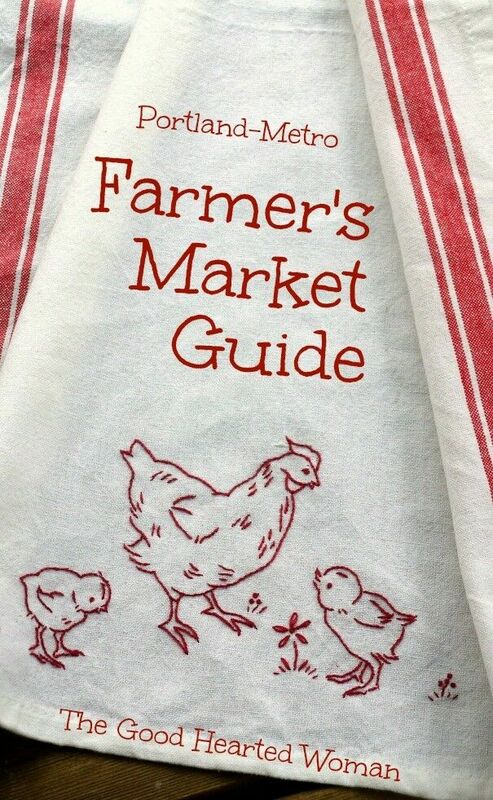 Features fresh produce, local growers, and talented, local crafters. Market offers fresh, local produce, herbs, plants, flowers, food and quality artisan goods. A dynamic, lively, mid-size neighborhood market that provides a place to shop for fresh, local, seasonal produce and artisanal goods, or relax and wind down after a long day. Happy Valley’s Sunnyside Farmers Market is an event that promotes and supports the community while fostering the growth of our farms, vendors, local businesses and families. Look for everything from jewelry to fresh vegetables and collectables. Bringing fresh, locally produced fruits, vegetables, plants, food and crafts to the community, supporting local farmers, and providing a community gathering place. Like the Tigard Farmers Market, this midweek market aims to bring fresh, locally produced fruits, vegetables, plants, food and crafts to the community, support local farmers, and provide a community gathering place. A fun, positive market that connects the community to local vendors and locally grown food, crafts, and services. The Tuality Hospital Farmers’ Market is the result of a partnership between Hillsboro Farmers’ Market, Inc. and Tuality Hospital to “build a healthier community.” This market is open to the public, visitors, students, and employees. This Green Market offers the best of local merchants, live entertainment, organic, locally grown foods and produce, and fine arts and crafts. The market is Southwest Washington’s #1 visitor attraction and home to over 250 vendors, offering a diversity of fresh and local agriculture products, quality prepared foods, and original fine artisan products. The market showcases a wide variety of vendors, providing local produce, artisan crafts, tasty hot food, live music and more. This family-friendly neighborhood market connects the community with local growers, ranchers, and food producers, and promotes healthy eating, food education, fun and music, and closer ties between farms and urban communities. Did I miss something? Has something changed? Please help me keep this list up-to-date! Please contact me here with updates.